Third Eye Management & Associates is excited to announce the first in a series of multi-media executive training programs, covering 39 different courses. The initial program – LEADERSHIP… MAVERICKS OF CHANGE™ – launches on January 26, 2017 at Silverspot Cinema, Mercato, Naples, FL. and is being presented by The Entrepreneur Society of America (ESOA) exclusively to non-profits organizations and presented by Third Eye Management founder, international speaker, business leader, coach, mentor and internet radio show host Karl M. Gibbons, who will guide attendees through the steps and explore what the leadership choice is capable of accomplishing, what it means, and how to get there. This program is built around 13 surprising leadership principles that challenge conventional wisdom. Through a series of interactive exercises, participants are introduced to ideas and actions that will help them lead their organizations to a new galaxy of possibility. “Leadership is a choice, it’s not a function. It happens when someone steps up and causes a change to happen. It happens when someone enrolls other people to help them make that change. Without leadership, all other organization resources are ineffective. Switched-on business leaders are aware of the concerns of their teams and are on top of new developments in leadership theory and practice to create more effective working environments”, said Karl Gibbons, founder Third Eye Management. All programs in the series are available in modules ranging from 45-minute keynote presentations, to full day(s) intensive workshops. Other program titles include Connecting the Dots, Quit & Get Rich, The Zebra Syndrome and Screw You – Pay Me! – which is bound to turn a few heads. 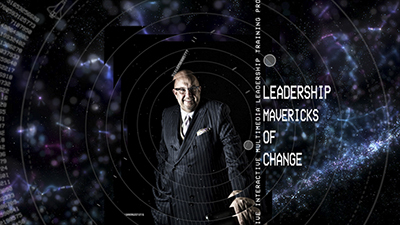 With a history of excellence Third Eye Management & Associates, it’s no surprise that the content and presentation for LEADERSHIP… MAVERICKS OF CHANGE™ is engaging and first-class. It will shatter your misconceptions of leadership and motivate organizations and their executive teams to achieve new heights of success through actively leading from within. Third Eye Management & Associates works with entrepreneurs and organizations of all sizes by helping them to bridge the G.A.P. (Growth, Automation and Profit) and turn their ‘good little business’ into a great business. Third Eye provides hands-on assistance to organizations that don’t have access to the resources and expertise available to CEOs of large corporations. Third Eye was founded in England in 1988 and is now headquartered in Naples, FL, working with a network of 5,000 associates in 22 countries around the globe, all united by the vision of thinking global and acting local.